People frequently ask me how I’m going to vote on specific candidates and issues. I’m usually happy to share my thoughts with folks in person, but this election is so crucial that I thought I’d list some preferences here. I encourage you to do your own research so that your vote reflects what’s most important to you. I’ve listed some of our most important local issues on the November ballot, from my perspective. You may agree or disagree with my selections and beliefs, but the most important thing is that you voice your choice this November 6! Registration and voting information can be found at SDvote.com. I urge a “yes” vote on Measure U, the city’s housing plan. The details are well-explained in this Coast News article and in my past newsletters. Get compliant with state housing laws – finally! Here’s a compelling opinion piece in favor of Measure U by Bob Kent and Lois Sunrich, published in the Coast News. Encinitans Bob and Lois are founding members of Keys4Homes, a group that advocates for affordable housing. One of the most important ballot initiatives to reject this November is Prop. 6, which repeals a major funding source for improving roads, freeways and bridges. Our highways and local roads need serious repairs and improvements, and the money that comes from the gas tax is exclusively dedicated to these repairs. Drivers spend more than $700 a year on tire repairs, shocks and front end re-alignments based on bad roads conditions in California. Additionally, poor roads are a major factor in collisions and car accidents. In Encinitas, we receive money directly from this funding source to pave our city streets. We also need the money countywide to plan and fund larger public transportation improvements, such as mass transit to the airport. Our roads and driving conditions will definitely get worse and driving will become less safe if Prop. 6 passes. Check out this short video on the No On 6 website and this sensible San Diego Union-Tribune editorial that advocates a “no” vote on 6. Mike Levin is an environmental attorney, dedicated to cleaner air and water, affordable healthcare for all and a fair tax and economic system. I support him wholeheartedly, believing he’ll represent our city and our entire nation admirably. Cardiff Planning Commissioner Jody Hubbard will be a great addition to our City Council, bringing focus to the local problems of traffic congestion and needed mobility improvements, prioritizing quality of life enhancements, and preserving and expanding beach accessibility. She’s a former CPA and a year-round cyclist and body surfer who brings energy and new ideas to the city – Jody is indeed a better fit for District 3. Here’s an interview with Jody from last Friday’s Encinitas Advocate. Current City Councilmember Joe Mosca has done an excellent job on the Encinitas City Council for the last two years, helping residents, prioritizing public safety, and bringing an honest and balanced approach to the job. Joe is a thoughtful, smart and civil voice on the council, and deserves to continue being an essential part of our progressive leadership team in Encinitas. Here’s a Coast News article about the District 4 candidate forum at the Olivenhain Town Hall a couple of weeks ago. Matt Brower is running against an incumbent judge, Gary Kreep, who was censured for inappropriate behavior and conduct. We need to have confidence in our judiciary (a somewhat ironic message after the recent Supreme Court spectacle, I know). Brower was a Judge Advocate in the Marine Corps, a lieutenant colonel in the Marine Corps Reserve, and a prosecutor at the District Attorney’s Office. I’ve heard him speak on several occasions and he is well qualified, even-tempered and believes all people deserve respect. Here’s an enlightening San Diego Union-Tribune Q&A with Matt. As a City Councilmember for the last two years, Tasha has demonstrated an impressively sharp mind and the commitment to a fairer and more just society. I’m excited about having such a motivated and qualified person represent Encinitas, and all residents of District 76, at the state level. She’s an environmental champion, committed to local control and will work with dedication on the issue of housing affordability. Amy is a member of the city’s Environmental Commission and a dedicated advocate for students. She’ll be a great addition to this board! Rhea is a previous Cardiff School Board member and a former city commissioner. She’s thoughtful, balanced and experienced. Thank you for your Sunday morning updates. I always look forward to them! Congratulations on passage of the Granny Flat bill, I know you put a lot of time and effort into that! It’s nice to know that in our small corner of the world there are still civilized people working for a better life for all of us. And finally here is Honey, president of Cats for Catherine! 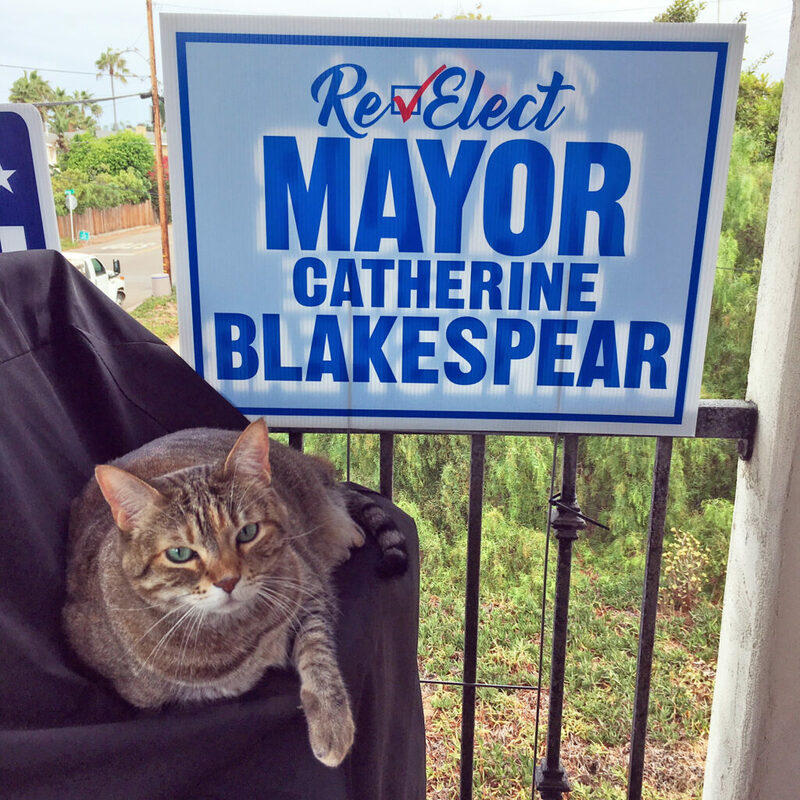 If your family (or your family pet) would like to show off their very own free “Re-Elect Mayor Blakespear” yard sign, just click here. And any donations to my campaign would be most appreciated! You can do that here. Mail ballots have been sent out. Completed mail ballots must be returned or postmarked by Election Day, November 6. Saturday, October 27, 3 p.m.: Meet and Greet for City Council candidate Joe Mosca and me at the home of Sally Foster. Email sfoster@miracosta.edu for address and details. Tuesday, November 6: Election Day! This is a big one. Exercise your right to vote!